Laurie was born in Madrid, Spain, in 1972, while her parents were serving as overseas missionaries. Her family returned to the United States in 1975 when her father took the job as head of the missions department at Dallas Theological Seminary in Texas. He later served as president of CAM International, and continues to speak in churches and at mission conferences all over the world. Clearly, missions and evangelism have always been a part of Laurie’s upbringing. The Lord convicted Laurie of sin at the age of 6, and opened her eyes to the truth of the gospel. When Laurie was 20, God’s grace became even more apparent and real to her, leading her into complete submission and willingness to follow the Lord wherever He would lead. She took short-term mission trips to Guatemala and Mexico, and served three semesters teaching Art at a school for missionary children in Bolivia, South America. While teaching, helping with the youth group, and leading small group Bible studies in Bolivia, Laurie sensed a deep conviction to receive more training in Bible. She returned to Texas in 1997 and enrolled at Dallas Theological Seminary in 2000 for a Master of Arts in Bible. John was born in Arlington, Texas in 1970. John’s father belonged to the Mormon Church in Idaho, but he stopped attending when he moved to Texas. John grew up never attending church. 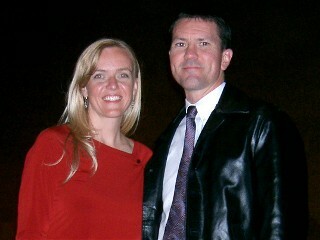 John began dating a lady in 1997 and started going to a Bible church with her. The relationship was not pure, but when the Lord caused John to come to faith in Christ in 1998, John repented of that relationship and joined the Singles group at church. John matured in faith during the next few years, being discipled, leading small group Bible studies, and volunteering at church. John went on his first mission trip with Watchman Fellowship to Utah for the 2002 Winter Olympics. After that trip John continued serving in the Single’s ministry. John met Laurie and fell in love with her. She came from a mission-focused family and loved to share the truth of the gospel of Christ. They have taken mission trips together to Manti, Utah, every year since 2002. They were married in 2003 and have continued to support Timothy and Suzie Oliver. They are still discovering their love for the gospel and the desire to share it with others, in order that the Lord may use them to bring one of His sheep to salvation. Laurie is finishing her degree at Dallas Theological Seminary in May 2005 and John will be attending The Master’s Seminary, if accepted, in 2006. They plan to be in California until John completes coursework in a Masters of Divinity, and then move to Utah or Idaho for full-time ministry work with members of the Mormon Church.